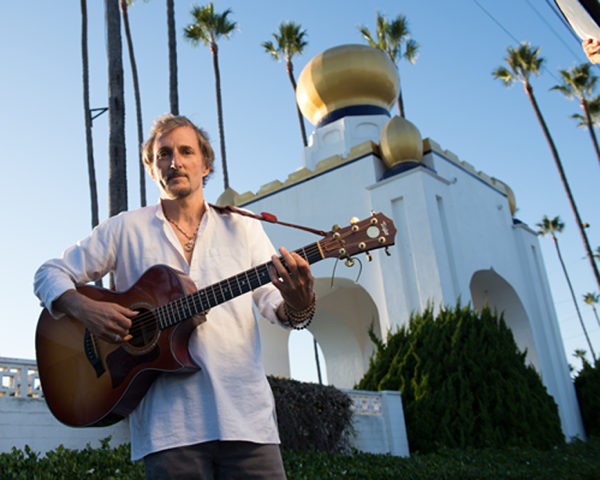 Philippo Franchini is an inspired singer, composer, bhakti yogi, masterful guitarist and sound healer. Also known as “The Musical Alchemist”, Franchini began his study of music at eight years old; yoga and meditation soon followed at age fourteen. The son of an Italian father and American mother, Franchini always loved music and fell in love with the guitar as a young boy listening to folk tunes and cowboy songs. He began studying classical guitar with a passion when he was eight years old. With this strong foundation, he began exploring a wide range of musical genres, with interests as far and as wide as Indian classical and chant, Brazilian pop, Reggae, Rock n’ Roll, Blues and Gospel. Amazingly, Philippo weaves it all together in a beautiful, uplifting Musical Alchemy – and his exploration continues! Philippo was fascinated by the power of music to evoke and transform emotions and states of consciousness, and began studying Nada Yoga and Sound Healing with noted teachers such as Dr. John Beaulieu and Sylvia Nakkach. Many of his compositions are infused with compelling tones and sonic healing energy and are beneficial for yoga practice, meditation and, of course, dancing! A longtime bandmate of kirtan troubadour, David Newman (aka Durga Das) Philippo has blazed the bhakti trail around the world, playing festivals, yoga retreats and teaching workshops. He has five albums available and has contributed to dozens of other artists work as well. Currently Philippo lives in both California and Europe.